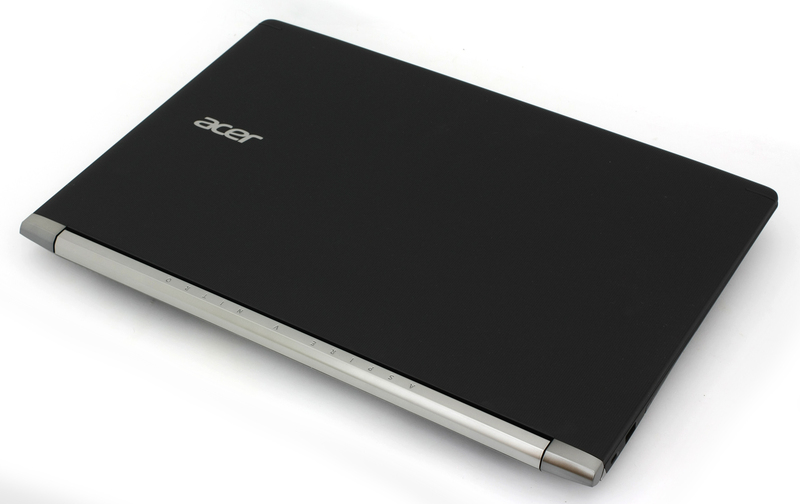 If you haven’t caught up to our pace, you might be interested in our recent review of the 15-inch Acer Aspire V15 Nitro Black Edition as it’s practically the same notebook but with a smaller screen size. Just like last year’s 17-incher, this year the company keeps things modest with the features the larger model offers. There’s nothing too special about this model rather than the larger display diagonal. 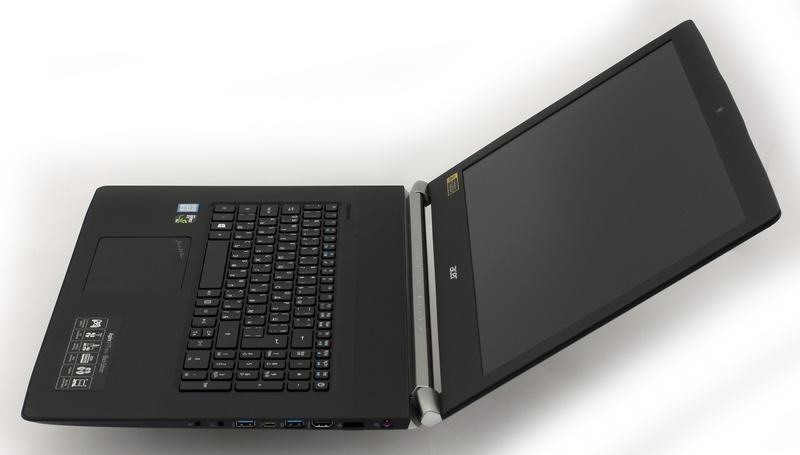 So unless you are in a need of more working space, like the V17 Nitro offers, maybe the 15-inch variant would be a better choice. Don’t get us wrong, though, the 17-incher is still a compelling choice with great value but doesn’t deliver more storage options, a larger battery or any significant change in the design or ergonomics that would draw the general user. 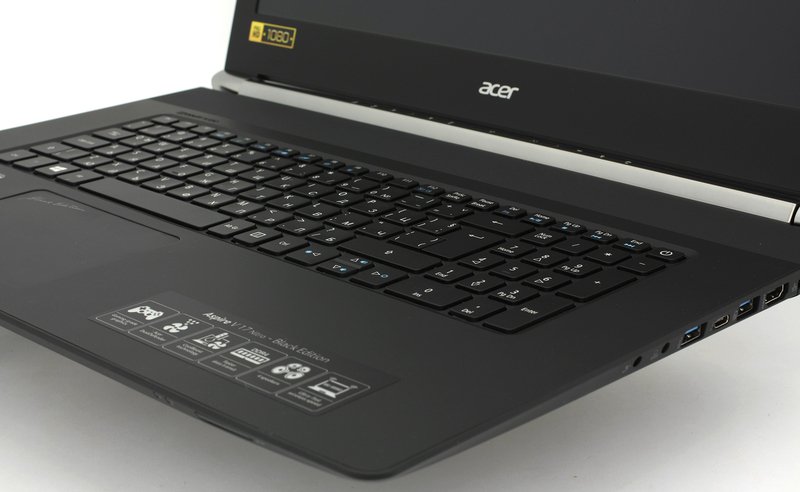 Anyway, here’s our take on the refreshed Acer Aspire V17 Nitro Black Edition (VN7-792G) gaming notebook. 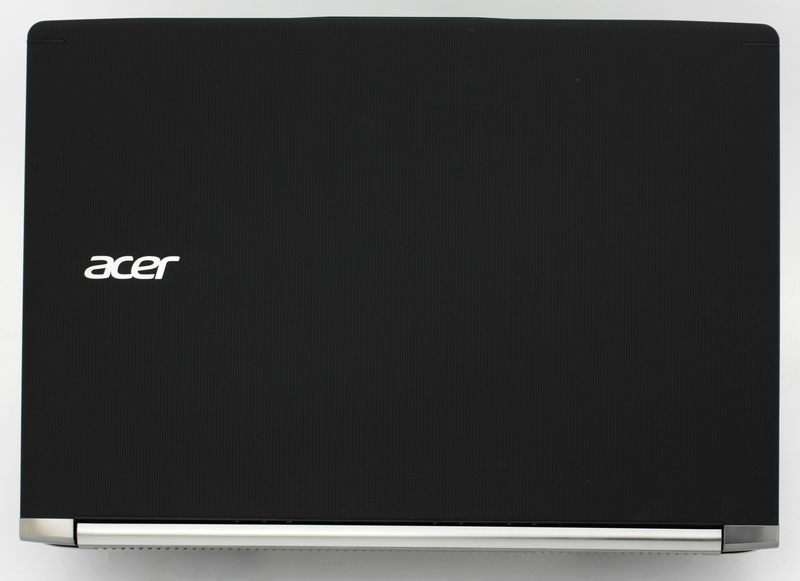 You can find the notebook and its available configurations at Amazon.com. The luxurious black box contains all the usual user manuals, AC charger, charging cable and the notebook itself. As we mentioned before, the V17 Nitro is just a bigger version of the V15 Nitro Black Edition – it uses the same design signature, materials, and build. Of course, the weight has grown along with the size (3.1 kg) as well as the height of the machine but interestingly enough, this year’s 17-inch model is also a bit heavier and a bit thicker than last year. Contrary to its little brother who trimmed down a few millimeters and went lighter compared to its predecessor, the V17 Nitro is actually the other way around. Luckily, though, the increase in weight is negligible. Nothing has changed about the lid – it’s still with aluminum base fused with soft-touch rubberized plastic using the so-called nanoimprint lithography process. This way the notebook keeps the much-needed rigidity without sacrificing the grip and pleasant feel to touch. We also noticed that the lid feels way stiffer than before and the area between the hinges isn’t as flexible as last year. Moreover, the hinges aren’t too tightly pulled so opening the notebook with one hand is a pleasure. That’s a small but notable improvement. And as for the bottom piece, it features the same nanoimprint lithography-made material but without the stripes on the top. You can easily notice the silicone legs, the vent for extra airflow under the fans and the stereo loudspeakers near the front. We are happy to see the same interior design as before with solid keyboard tray, illuminated keyboard with better ergonomics, large and responsive touchpad, and a small addition – red LED stripe between the hinges. The latter wasn’t present in last year’s version. The keyboard offers the same key travel as before but this time, the keys are slightly curved to better fit the user’s finger. 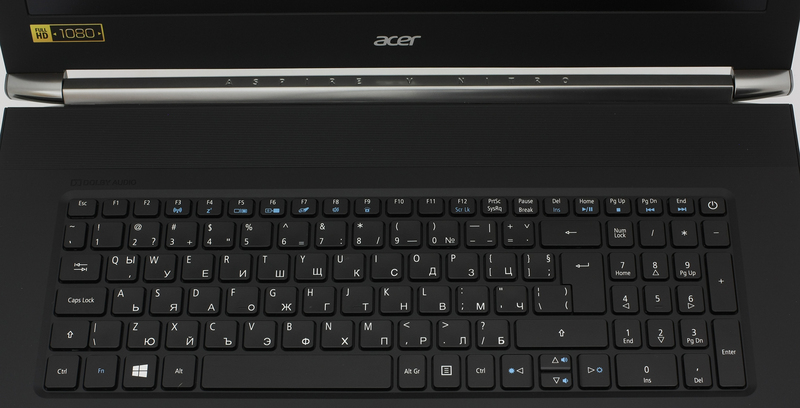 But one thing remains a mystery – why does Acer keep making small arrow keys for a gaming-oriented notebook? Full-sized arrow buttons would have been way better. And as for the touchpad, unfortunately, we’ve experienced the same issue that the 15-inch version had – the erratic performance and twitching cursor. We cannot be sure if this is caused by a faulty touchpad, but we tested the 15-inch and 17-inch versions and both share the same issue. Anyway, the device makes oddly loud clicking sound but it’s responsive and easy to use, nonetheless. Despite the “gained” weight and larger profile, the 17-incher still brings a lot to the table for the asking price. We are extremely satisfied in terms of build quality, sturdiness, and design. Our only complaint would be the impractical port placement and the fact that the finish used for the chassis is a fingerprint magnet. 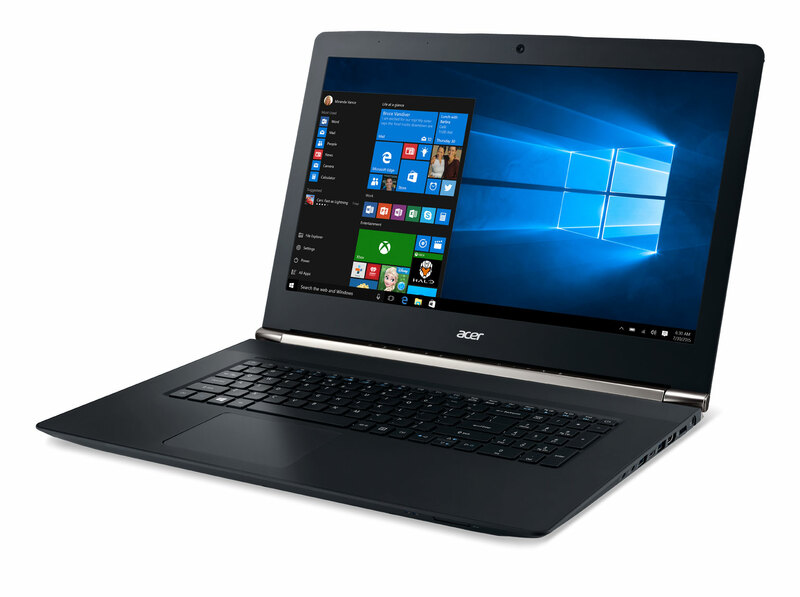 Acer Aspire V17 Nitro offers 17.3-inch IPS panel with Full HD (1920×1080) resolution with 16:9 aspect ratio, 0.199 x 0.199 pixel pitch and pixel density of 127 ppi. 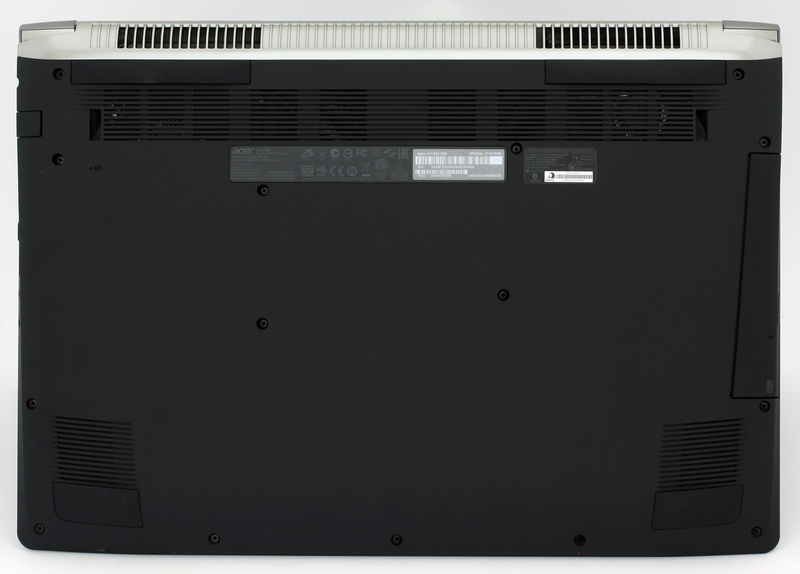 The panel is manufactured by AU Optronics with model number B173HAN01.0. It can be considered as “Retina” if viewed from a distance equal or greater than 69 cm. Since this is an IPS panel, we are dealing with good viewing angles from a 45-degree incline. We were able to record a pretty good result – 314 cd/m2 with a deviation of only 5%. The average color temperature on the screen appears to be a bit colder than the optimal 6500K but still pretty close – 7280K. Again pretty good result – 94% sRGB color gamut coverage as you can see from the image below. That’s enough to ensure vivid colors and good picture quality at some extent. The image below is practically the same as the one above, but this time, you can see the colors that have 100% and 50% saturation and the reference colors on the white dots. The gamma curve aligns almost perfectly with the standard 2.2. We calibrated the display at 140 cd/m2 and color temperature 6500K. We tested the display using 24 commonly used sample colors like skin tones, grass, blue sky, orange etc. The average DeltaE 2000 is equal to 0.64 after calibration – this means really accurate color reproduction. The contrast ratio is 1310:1 before and 1270:1 after calibration. Both results are excellent. We also included other colors in the test as you can see from the graph below. We were surprised that the panel doesn’t use PWM for adjusting the screen brightness. This means that the panel will not cause eye fatigue even to users with sensitive eyes. The notebook features a great panel that offers not only superb image quality but it’s also user-friendly and it’s suitable for people with sensitive eyes since there’s no screen flickering across all brightness levels. We are dealing with comfortable viewing angles, bright screen, high contrast ratio and wide sRGB color gamut coverage. 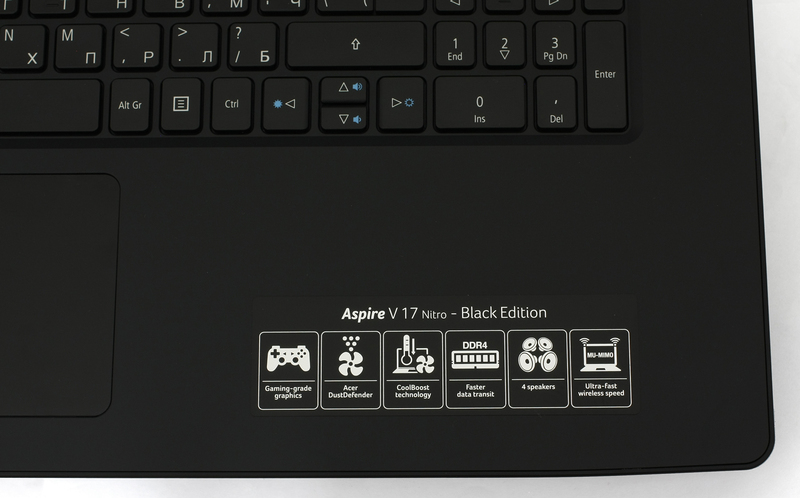 The results from our tests suggest that it’s better to opt for the 17-inch variant of the Aspire V Nitro Black Edition family because it offers better screen quality than the 15-inch version and even surpassing some of its competitors. Just like its predecessor, the new V17 Nitro Black Edition excels in sound quality. The provided four loudspeakers can reproduce crisp and rich sound with frequencies ranging +/+6 dB. You can further optimize and customize the sound with the Dolby Audio software that has some presets for you to choose from. 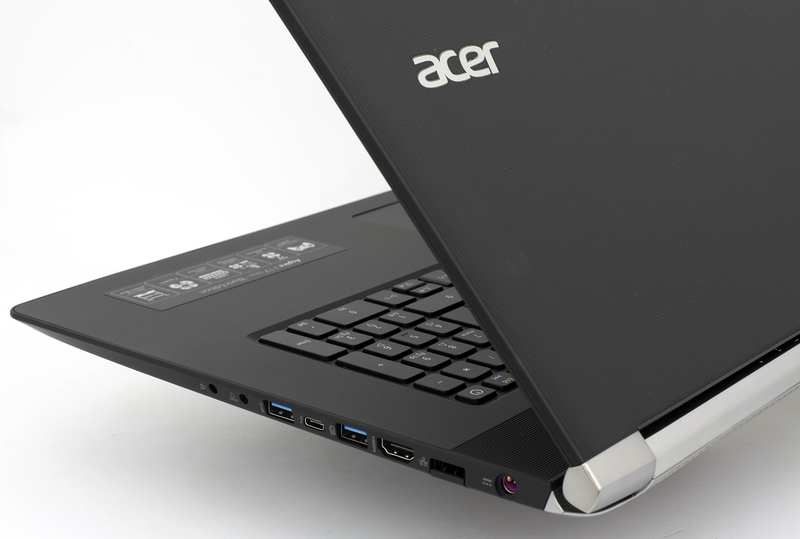 Unfortunately, the 17-inch version incorporates the same battery that we found in the 15-inch variant (3-cell 52Wh). We expected, at least, bigger battery since there’s a little bit more room in the chassis and also to compensate for the biggers screen that will surely consume more energy than the 15.6-inch display. The results from our battery tests aren’t as satisfying. All tests were performed with the same settings – Wi-Fi turned on, screen brightness set to 120 cd/m2 and power saver mode turned on. Roughly the same runtime as last year’s model – 290 minutes (4 hours and 50 minutes). Much better result – 346 minutes (5 hours and 56 minutes). Of course, this is the most demanding test and it’s quite unlikely that you will start a gaming session away from a power source – 61 minutes. Intel Core i7-6700HQ represents the Skylake H family and is considered a high-performance chip with high voltage – 45W TDP. 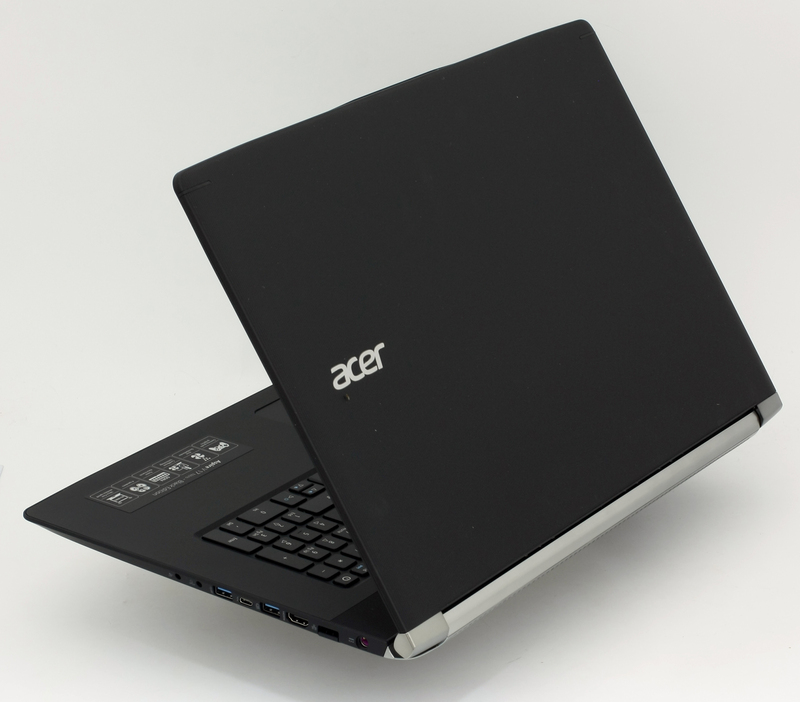 This is a step down from its direct predecessor – Core i7-4700HQ, but matches its short-lived predecessor Core i7-5700HQ. The Core i7-6700HQ has four cores ticking at 2.6GHz and can go up to 3.5 GHz for one active core and 3.1 GHz for four active cores. The silicon supports the so-called Hyper-Threading technology that emulates one virtual core for each physical, thus establishing a total of 8 threads. The GeForce GTX 960M (2GB GDDR5) is located in the high-end graphics card niche, but is used mostly in budget gaming laptops. It is part of the Maxwell family of GPUs. It features 640 CUDA cores or simply – shading units, along with 32 ROPs and 53 texture units. It has 2GB of dedicated VRAM (GDDR5 in this case). The bandwidth of the memory is 80.2 GB/s and the bus is 128-bit wide. The GTX 960M uses the same GM107 GPU core that we saw in last year’s 860M, but this one is mainly aimed at bumping the notebook’s battery life and adding some extra performance, but that’s not stressed as much. However, the GM107 is clocked a bit higher than last year’s model – 1097MHz of base clock and boost up to 1176MHz. It also supports a resolution of 2048×1536 through the VGA port and 3840×2160 with DisplayPort and HDMI. We would like to note that this two-staged test doesn’t represent real-life situations but it’s a good way to assess the overall stability of the system under high load for longer periods of time. In the test, we include 100% CPU and 100% GPU stress tests so as you’ve probably guessed, it’s pretty hard to reach 100% load on both chips by using CPU and GPU-intensive applications. 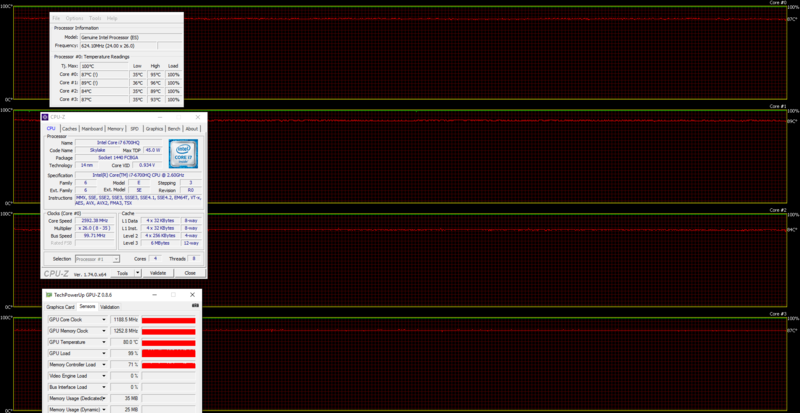 We start only with 100% CPU stress test. The normal temperature of the CPU was 35 °C and when under heavy load – around 82-86 °C. Both results are more than acceptable given the fact that the CPU was running at solid 3.1 GHz and that’s the maximum operating frequency for all four active cores. After an hour had passed, we turned on the GPU torture test as well and leaving it like that for another hour. The temperatures of the CPU got as high as 96 °C but in order to keep things cool, the system reduced the clocks of the chip to 2.6 GHz, yet still in the acceptable range. We cannot consider this as throttling since the listed base frequency of the Core i7-6700HQ is 2.6 GHz. Luckily, the GPU was also stable at its maximum operating frequency and temperatures a bit high – 80 °C. Anyway, nothing that the notebook didn’t handle. As you can see from the temp map below, the notebook was running pretty cool and that’s another reason to choose the 17-inch version over the 15-inch Nitro. 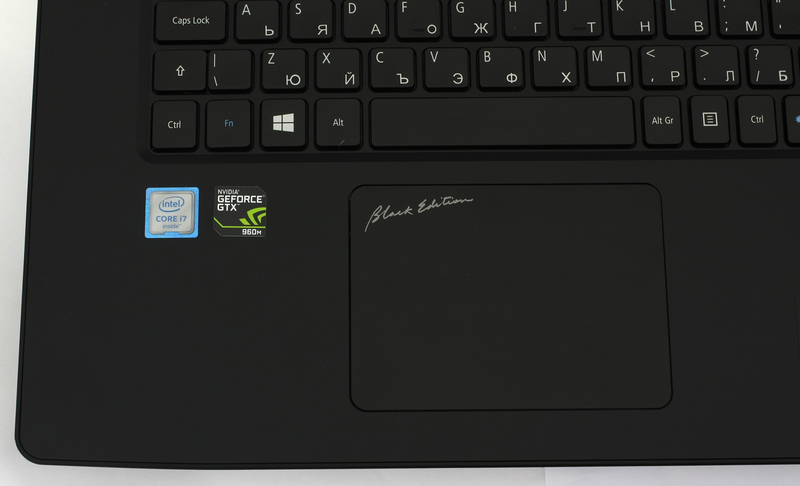 Since the keyboard is placed a bit lower, the higher temperatures will not affect the user experience at all. 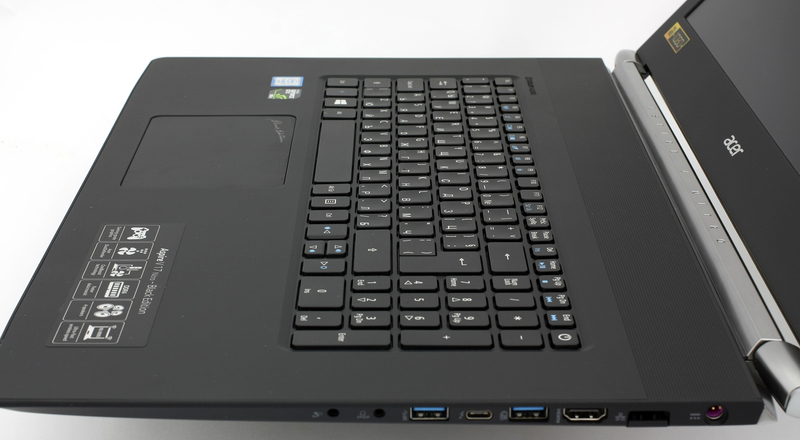 However, the notebook offers really competitive hardware for the asking price and room for upgrade – you can replace the optical drive with another 2.5-inch drive or insert a 2280 M.2 SSD stick for speedy data transfer. On the other hand, the 17-inch version isn’t so compelling compared to the 15-inch version – it offers the same hardware and the same battery that’s unable to keep up with the power demand. Yet, the better screen quality, the absence of PWM across all brightness levels and better cooling capabilities are really good reasons to opt for the bigger sibling. 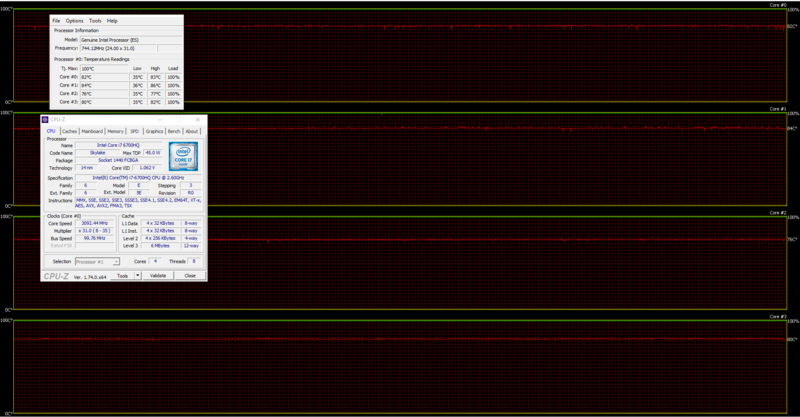 Is it possible for you to make the calibration of the screen you made available for download? I wish they would reply to your comment because I need to know too! … if it is the right one for you of course. is display response time low as some other mentioned it any ghosting plz someone respond? We are working on that as well. i7-6700hq, 16gb DDR4 2400mhz Ram, Samsung MZNLN256HCHP 256GB SSD, HDD @5400, GTX965M, FHD IPS display, Thunderbolt 3.
why my laptop keyboard cannot work? i had to use extenal keyboard. who can advise? Johnson, buy a bluetooth wireless keyboard.